Join the discussion on our forums! Come discuss Grumble, Worldshaker over in our dedicated Grumble, Worldshaker discussion topic. Still can't be combined with Malygos though. 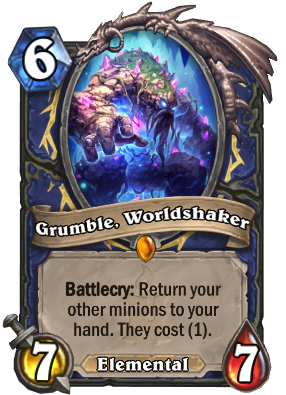 even if grumble gets nerfed...zola anybody? Thats one cast per turn instead of 10, not that it matters, shudderwock has its time to shine and now everyoens going back to cubelock. This card should get nerfed, not Shudderwock. Well, Shudderwock's 15 minute animations need to be fixed either way. 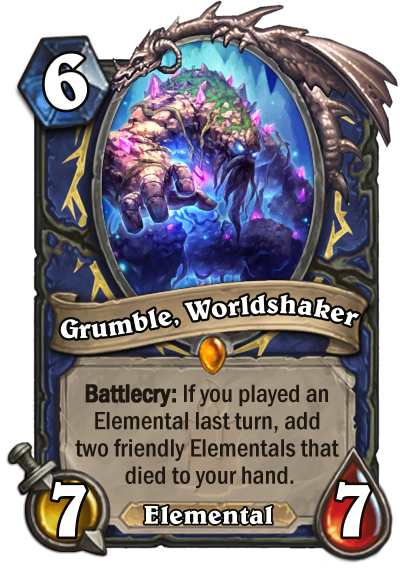 But I could see Blizzard adding an Elemental only clause to this card. Wouldn't fundamentally change Grumble and still leaves Shuds with plenty of other options. I have a better idea for a rework to Grumble. Change it to be a tool for Elemental Shamans. Please please please please Blizzard, make elemental shaman viable next expansion... Shaman needs something that works that doesn't involve aggro or evolve for once. made a jade elemental deck that really benefits from this card! Man i loveeee this card, having so much with it in elemental/jade battlecry deck. From rank 5 to 3 with 70% winrate, such a fun deck. This card is good in battlecry/elemental deck, but not "meta-defining" lvl of good, just "ok, i can return my Servant of Kalimos and get some value from this". Think about this..... Malygos shaman with large amount of card draw something close to this http://www.hearthstonetopdecks.com/decks/malygos-miracle-shaman/ All the minions are good to bounce. And the combo with barnes, barnes into malygos or auctioneer drop them both into hand and next turn instant win game. This card is pretty amazing. That's feasibly six extra battlecrys from your minions, would also work quite well with all the evolution stuff you conjure up!! There may be many worlds, but there's only one Worldshaker.